★ What is it? VR-P25U is a lightweight portable handheld RF amplifier. With the preamplifier you can easily extend the communication range of the handheld radio. ★ Use the preamplifier to create: a mobile device with a vehicle-mounted antenna, a powerful field radio with a field-installed antenna, a radio with a base station on a mast. 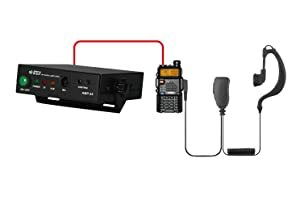 Your handheld radio connects in seconds and can just as easily be disconnected and taken along the way. ★ High output power up to 40 watts: with an input power of 2-6 watts, up to 40 watts of output power can be achieved. ★ Suitable for FDMA mode (C4FM, D-Star, NXDN, IDAS, dPMR, P25, MPT1327, etc). Supports analogue handheld radios, e.g. Baofeng, Radioddity, Kenwood, Yaesu, ICOM, Motorola analog radios. ★ Certifications: All VGC amplifiers have been CE, FCC certified. VR-P25U is a lightweight portable handheld RF amplifier. With an input power of a handheld radio of 2-6 watts can be achieved up to 40 watts output power. All VGC amplifiers have been certified by CE, FCC. Includes voltage stabilizer, overheating protection, RF sensing, auto power off, harmonic filters. 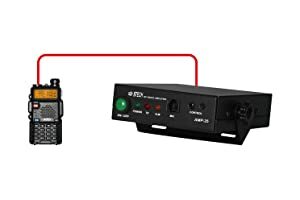 Connect to the antenna output of the handheld transceiver to the RF-IN connector on the rear panel of the amplifier with the Radio to Amplifier RF cable. Transmit and receive right on the Handheld radio - while your output signal is amplified. Connect to the antenna output of the handheld transceiver to the RF-IN connector on the rear panel of the amplifier with the Radio to Amplifier RF cable. Connect a speaker microphone, headset, or compatible accessory to the radio. 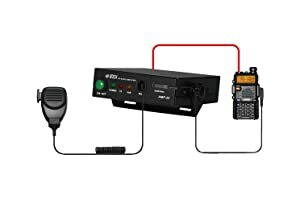 Transmit and receive right on the accessory connected to the Handheld radio - while your output signal is amplified. Connect the speaker microphone to the MIC jack on the front panel of the amplifier. Connect to the antenna output of the handheld transceiver to the RF IN connector on the rear panel of the amplifier with the Radio toAmplifier RF cable. Connect the accessory port of your radio to the Control jack on the front panel of the amplifier using the Amplifier Control Cable. Transmit and receive using the speaker microphone on the amplifier while incoming audio is relayed through the loud amplifier speaker.